You’re in a tight spot. Your client has asked you to setup a simple well-designed website in a short time. Now you are not an expert web developer, you are a strategist who can guide your client to build their perfect website online. Also, your client does not have expertise in maintaining the website or does not have a budget to hire a full-time web site developer for the site. Your options are limited but, you do have some widely used, easy to maintain, easy to develop, website builders available online. Weebly is a user-friendly website builder to create your website, blog or your e-commerce store. It uses a drag and drop website builder which helps you to create a professional website, even if you do not have any coding skills. All the content elements like photos, text, maps and videos can be added by just dragging and dropping them. You can create your website from your browser, nothing to install and no upgrades required. Many businesses have successfully created their websites with Weebly and are very satisfied with it. Infact, Weebly is used by more than 30 million users. You can view some of the success stories here. Once you have selected your theme, you can set up your website on weebly very quickly. Weebly uses the WYSIWYG (What You See Is What You Get) style web editor, this helps you to quickly drag and drop contents, images and once you are done you can hit the publish button. After that you can preview the web page and see if you need any further editing. Hence you do not need to have any technical, programming knowledge to create website quickly using this website builder. Weebly enables you to create a website with beautiful theme options. All the themes are responsive. Click here to see the theme options available. Weebly also provides you an option of creating your website with customized design, using HTML/CSS editor. Hence, this gives you more control over the look and feel of your web design. If you need more tools and functionality for your website you can check out the Weebly App Center. The tools are easy to integrate into your site like plug and play feature. The Apps are categorized as marketing, tools, communication, eCommerce and social. You automatically get a mobile version of the website you create with your chosen theme, as mentioned earlier the design themes are responsive. With the help of mobile support you can manage and update your website from any mobile device. It’s available on iphone, ipad, apple watch, android and android tablet. Weebly provides support with the help of chat and email support. Weebly has number of knowledge base articles for different categories, hence this covers most of your support requirements. Apart from this Weebly also has a community forum wherein you can post any of your requirements and you will be replied by the weebly team members or other weebly users. This feature helps you to create a membership website. You can add members, manage them in groups and control which pages they have access to. Weebly covers all your basic SEO requirements for your website. You can add your descriptions, titles, and keywords for your web page. Many Weebly websites rank well on google search pages and are seen on the first page of google. Weebly hosts website for you, hence you do not need to worry about any technical stuff like upgrades and security. Weebly also gives you option to export / archive your website. Hence in case you want to move your website to another web host you can do it easily. It provides pre-designed page layouts which is very useful for anyone who does not have any designing experience. They provide mobile responsive templates/themes. Designs templates provided are average. Template customization options are limited. Wix allows you to create interactive and professional websites. Take a look at examples of websites created with Wix. Wix has design layouts categorized as per your line of business. They have over 510 templates to choose from. It is an innovative website builder and their designs are at par with the latest design trends. Wix also uses WYSIWYG (What You See Is What You Get) style web editor, ie whatever you insert and see in the web editor will be published as output. It uses drag and drop builder which allows you to getting started and creating stunning web pages in a matter of minutes. With Wix you get 510 design templates to choose from, bet you would find at least one which fits your needs. Click here to view the templates. You have the option of using their pre-made templates or designing the web pages from scratch if you have designing skills. Note that you once you select the template, you cannot change it. Hence, it’s best you finalize the template and then add the contents. Otherwise, if you change the template you will have to again insert the contents. Also, Wix does not allow you to edit HTML / CSS codes, this limits you if you want to customize your design. Wix enables you to enhance the functionality of your website with Wix Apps. Their app market consists of more than 260 Apps. The apps are plug and play, you can install them with a click, you have a choice of fee and paid apps. Wix enables you to edit Wix mobile site separately from the desktop site. This allows you to create an enhanced user experience for your mobile users. Wix has a mobile action bar feature, this is a small bar which appears at the bottom of your mobile site display. This enables your site visitors to call, email, locate your address on map, or see your social profile with a tap of a button. This feature is very useful for your business making it convenient for your visitors to reach you via call or email. Wix boasts of 24/7 help center to answer any of your questions. You can also schedule a call, so that they can call you at your convenient time. They have a huge knowledge base and support forum, where you can post your query and you will get a speedy reply. Also 100’s of walkthrough videos and video tutorials to help you with your requirements. Wix covers all your basic SEO requirements for the web page. 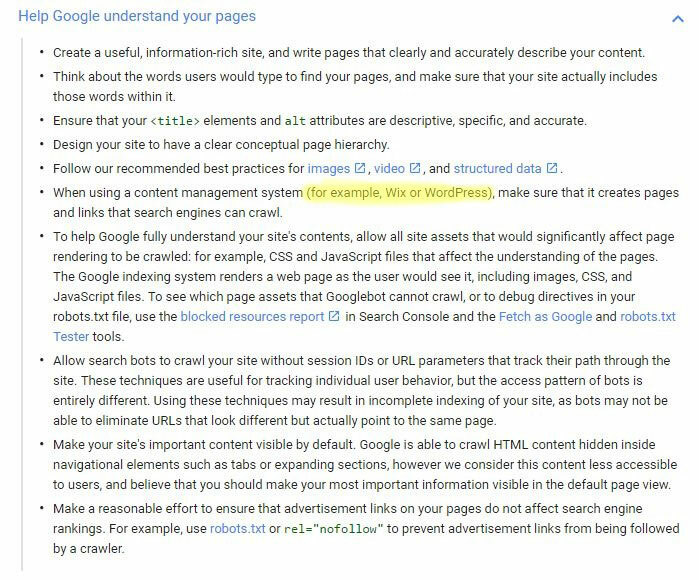 If you check the Google Webmaster guidelines, below they have recognized Wix. You can add your descriptions, titles, and keywords for your web page. Wix hosts website for you, hence you do not need to worry about any technical stuff like upgrades and security. One drawback is that Wix does not have export / archive option. 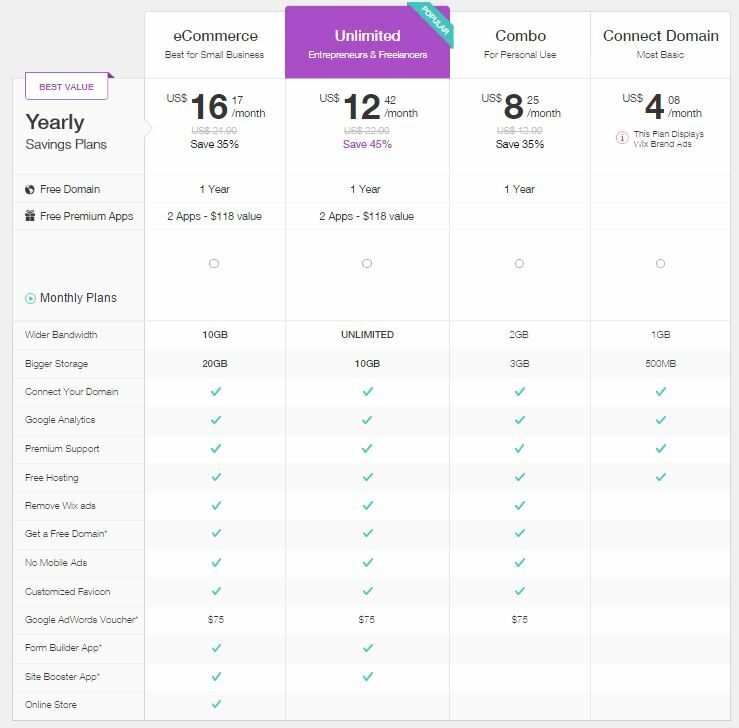 So you cannot take the website out of Wix if you decide to leave them and move the website to another web hosting. Provides you with one of the easiest to use drag and drop interface to create your web pages. You get a variety of professional design templates to choose from. They provide 510 templates. Switching from one template to other is not possible. The Free plan shows advertisement logo which is quite prominent. Squarespace is easy to use drag and drop style website builder. If you require a design oriented website then Squarespace is the right choice for you. It allows you to take full control of the look and feel of your website. It provides you neat and simple designs and you can make the design which is more graphics and imagery-oriented. Squarespace has more than 1 million paying users, hence their product and service is definitely good. Squarespace does make your job of building a neat website very easy. You can just drag and drop content and effortlessly create web pages. You can watch the useful help videos which will provide you all the information to create web pages using the website builder. 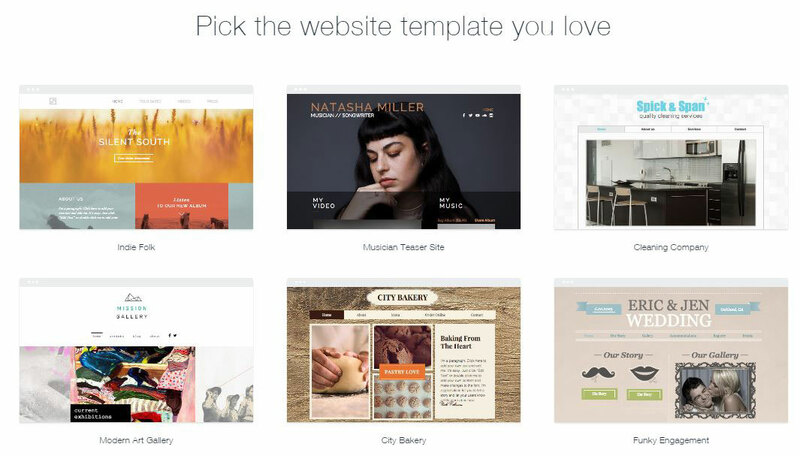 The design templates from Squarespace are a cut above what other website builders provide. The designs look neat, top notch and expensive, very much the ones which designers will like. Although they do not have hundreds of templates but the ones that are available are of top quality. Squarespace provides you more elaborate e-commerce capabilities than other website builders. If you are planning to create your online store, then Squarespace has elaborate e-commerce tools that can help you to create a successful e-commerce website. Squarespace covers all your basic SEO requirements for the web page. You can add your descriptions, titles, and keywords for your web page. Squarespace produces web pages with clean HTML markup which helps to easily index web pages. It automatically creates a sitemap for you which is an essential part of SEO. Squarespace provides you support 24/7 via chat and email. Care is taken that all the support requests are answered within 1 hour which is a good turn around time. They have an extensive knowledge base offering videos, workshops, and detailed help guides. They also provide a community driven forum where you can post your questions and get answers from experts. Squarespace takes care of your hosting so you need not pay for hosting and other technical aspects of web hosting. This helps you focus on your business instead of the technical stuff. Squarespace allows you to export your site to WordPress which is a unique feature not seen in any other website builder. Squarespace provides you with classy imagery and designer- friendly layouts. All the Squarespace templates are responsive. Squarespace provides elaborate e-commerce store options. The dragging and dropping of blocks of contents are not as userfriendly as other website builders. Great, you have come this far. I hope by now you must have decided on the best website builder for your requirement. And hope you have found the review useful. So, don’t wait to get going with one of the website builders and get your business online. Let me know which one you would choose and why. I really hate how bad the Wix ad looks on their free sites! Weebly also shows an ad on their free version but the ad is not nearly as annoying. As for the paid options I think I like Weebly’s cheaper plans and Wix’s higher priced ones. Squarespace is so and so with me.